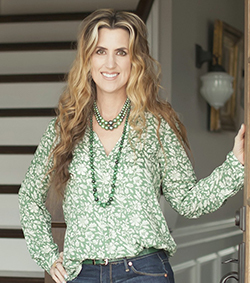 When the EBTH (Everything But the House) online auction company contacted me about being an official EBTH Tastemaker, I was more than happy to oblige! 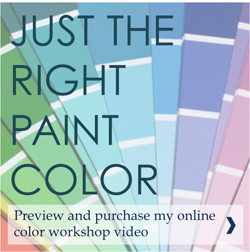 I love auctions and estate sales, and EBTH is a hybrid – giving you the best of both worlds. Just last week, I bid on and won a Roberto Cavalli dress from EBTH in a Nashville designer clothing sale! 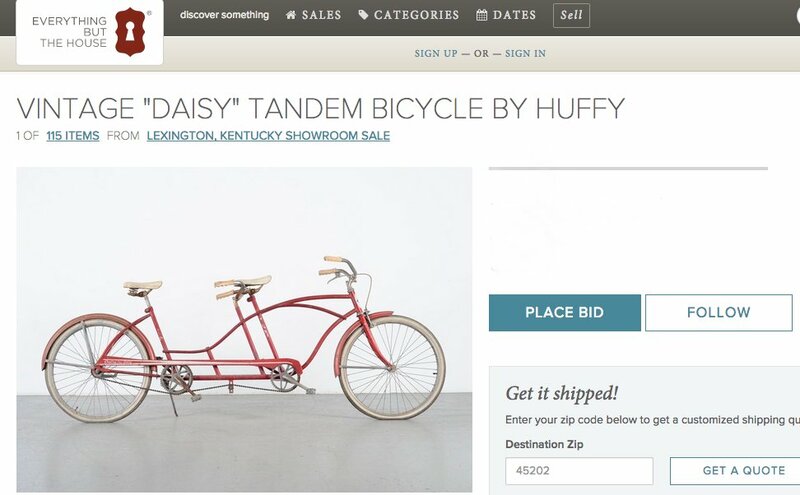 I thought this time I’d do my hometown of Nashville a favor of making my favorite EBTH picks from the current Nashville sales. Now, that doesn’t mean you can’t purchase things from out of state – some things can be shipped right to you, wherever you are. Now, here’s my top 10 for this month! 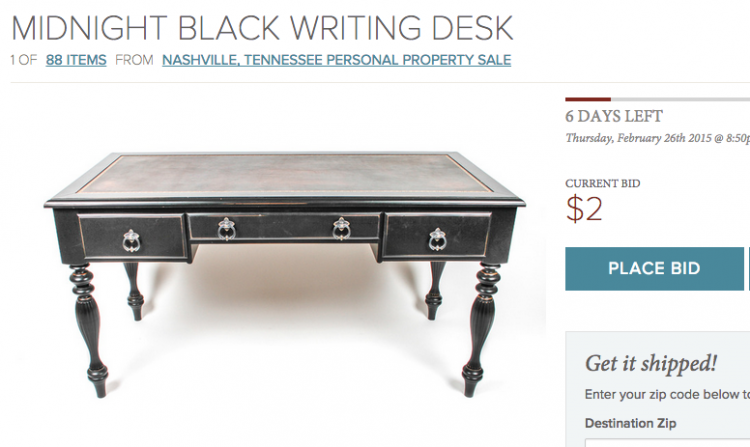 This writing desk is ideal for an attractive home office. 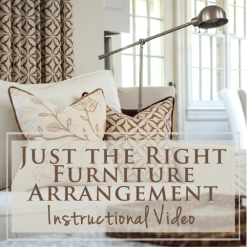 A beauty like this is perfect in the middle of that unused front living room, facing the entry with some beautiful bookcases and an upholstered wingback chair behind it. Mr. Man thinks I’m a chair hoarder, and that may not be far from the truth. My heart starts beating fast when I see a colorful vintage upholstered chair like this one. 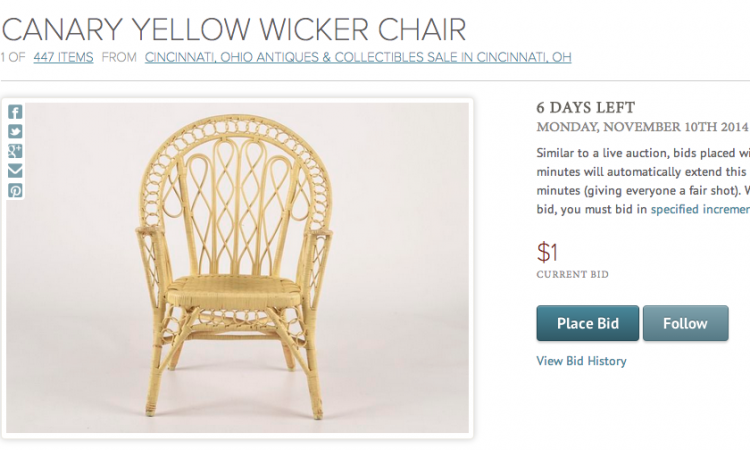 Vintage chairs are made better and are usually more comfortable than modern, mass-produced versions. 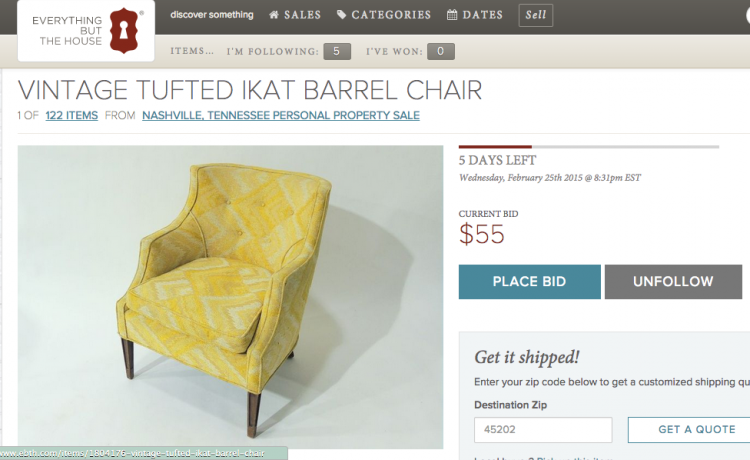 I really love this sunny little chair, and there’s actually another one just like it available in this Nashville sale. 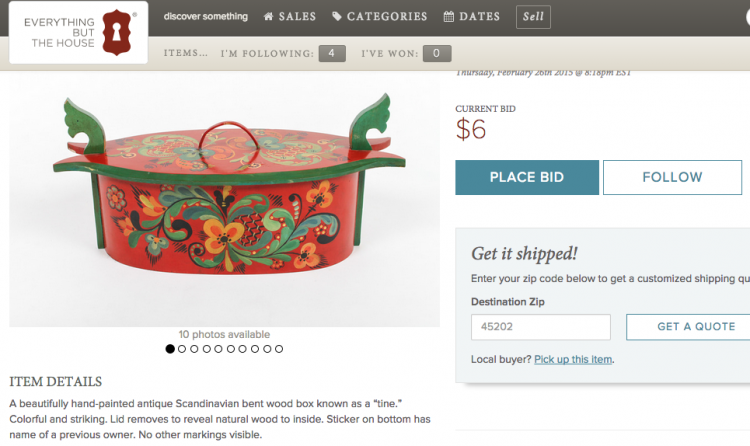 Always a bid fan of COLOR, I think this Scandanavian box would be a colorful edition to kitchen shelving or even a bookcase. If you live in Nashville, you gotta have a pair of cowboy boots. 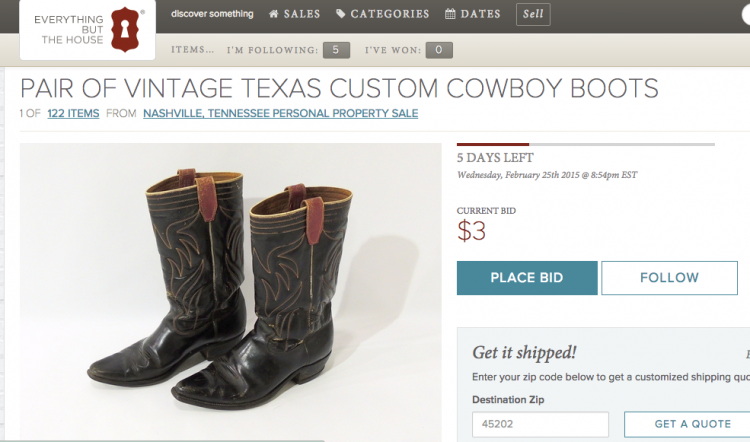 And these vintage, custom-made, Texas-style boots are sure to get some attention wherever you live. 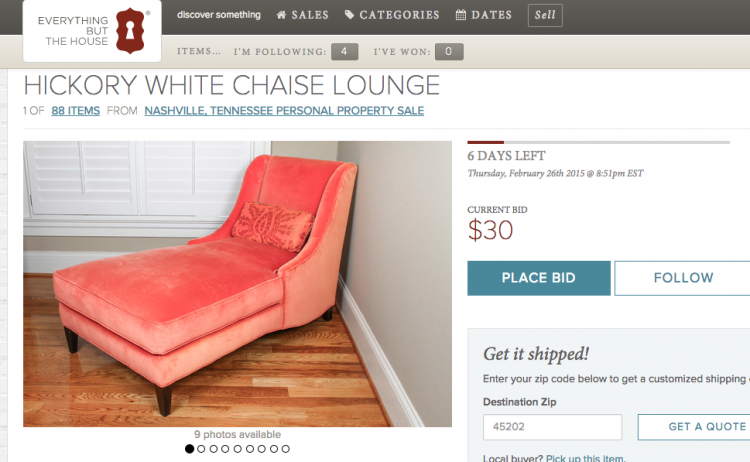 This velvet chaise is absolutely swoon-worthy! 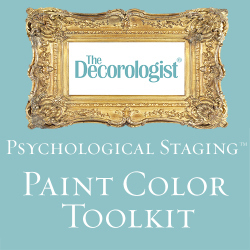 And it’s in one of the most popular decor colors of the year – CORAL! I really want it. I collect vintage costume jewelry – especially necklaces. 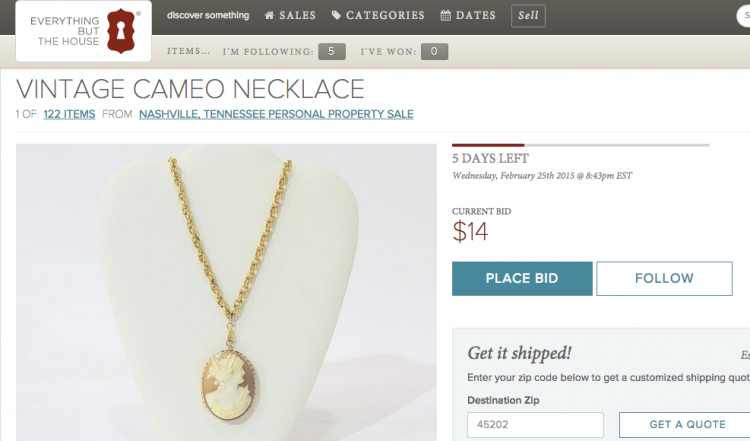 This class cameo is an absolute stunner, and this particular Nashville sale is FULL of jewelry. 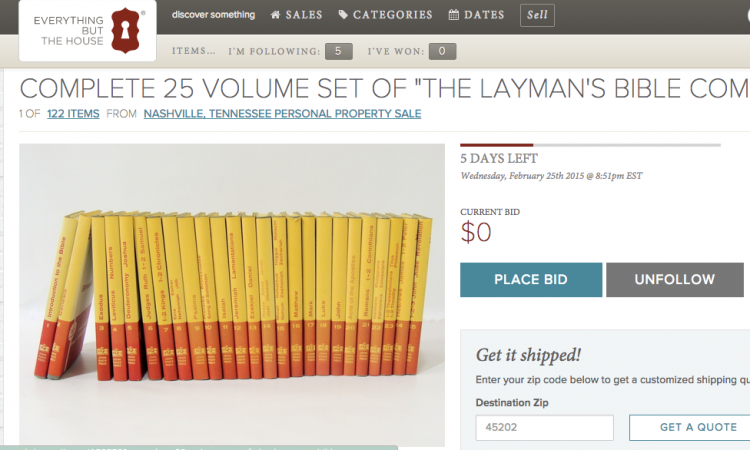 EBTH always auctions off sets of vintage books, which I definitely have a weakness for. This set doesn’t even have a bid yet, so you could probably get it for a song! Not only is it a great reference set for studying the Bible, the jacket colors are really happy. 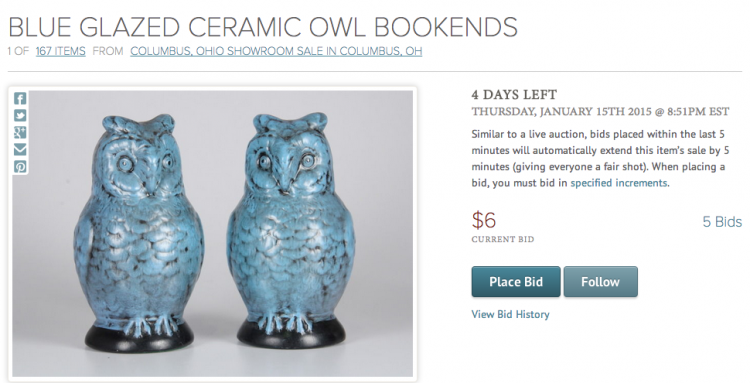 Did you think that EBTH only auctions vintage or antique items? Not so at all. 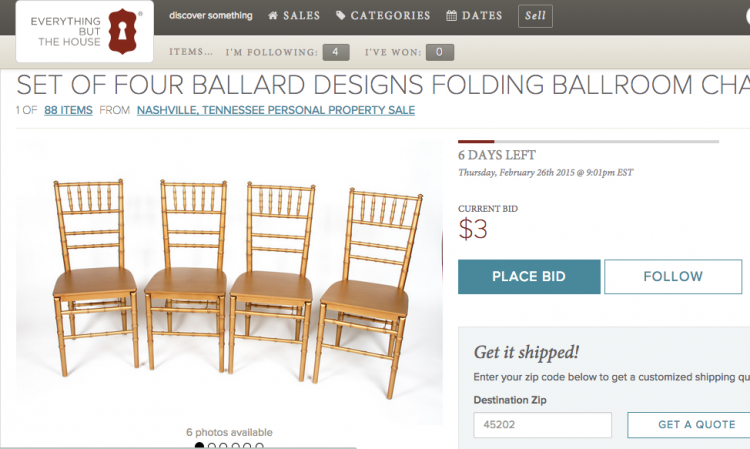 Check out these gold Ballard Design folding chairs up for sale. I’ve always wanted some of these, and you could definitely score a deal on them if you buy them here. They’re currently available on BallardDesigns.com for $249 a pair. Did you know that filing cabinets can actually look cute? 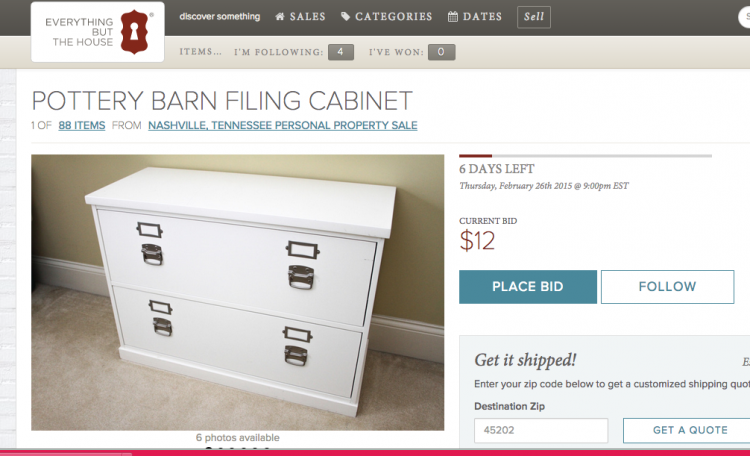 This white cabinet is from Pottery Barn and is available for auction. 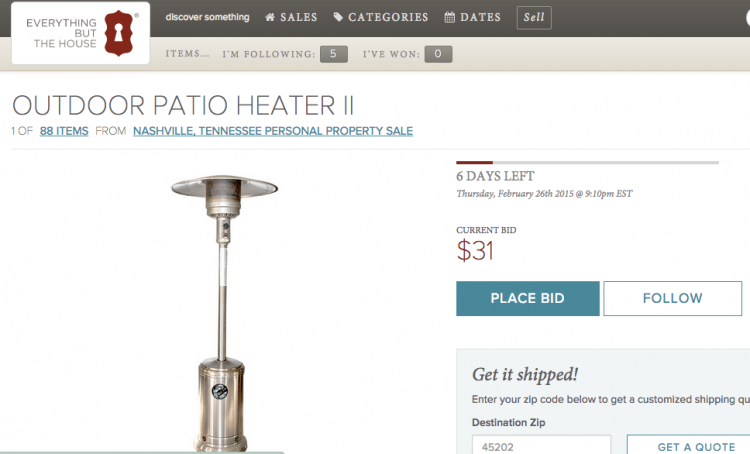 And in honor of the recent ice storm and frigid temperatures over the last week in Nashville, I thought my final pick would be this outdoor space heater. I always love to snuggle up next to one of these on porches of my favorite local restaurants, and there’s no reason you couldn’t do the same on your own back porch. Thanks to EBTH for sponsoring my Top 10 Picks of the month! EBTH holds 50-60 sales per month, so make sure to get on their email list or follow them on Facebook to find out about their current sales. 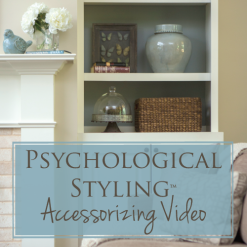 If you could have any of my Top 10 items this month, which one would you choose? 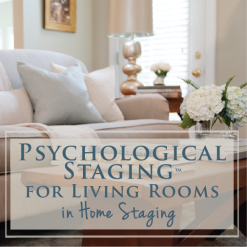 This entry was posted in Collective Soul, Decor Addiction, Sponsored and tagged auction, ebth, estate sale, everything-but-the-house, nashville, online-auction, sponsored. I don’t know whether to kiss you or curse you Kristie 🙂 – I’m ADDICTED to this site! 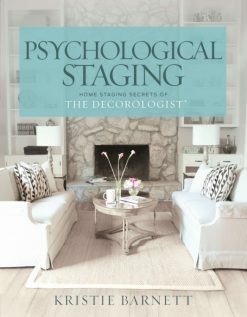 I’ve bought several goodies, and I’m planning to use the Nashville branch to sell things I’m leaving behind when I move to a new house in a couple of months. Thanks for the tip!